Video killed the radio star; and escape games killed the point and click adventure genre.. Or so it seemed. Which whilst sad, doesn't surprise me any; as when it comes down to it they're not too different. An escape game is just a point and click adventure without the plot.. Or to put it another way, it's a point and click game made by lazy developers. That's not to say they're all bad.. Just the overwhelming majority of them; which often rely on obscure puzzles and combination locks to pad out a lack of imagination. Which is okay if you like that sort of thing, but it's no substitute for a genre that has included such classics as Maniac Mansion, Monkey Island, Broken Sword, and Flight of the Amazon Queen. So, being so nostalgic about the classics as I think of them, it's nice to see that some developers are still producing point and click adventure games; and better yet that they can be played in the comfort of your own browser. My first pick for Meeple Arcade within this genre is Midnight Cinema by Carmel Games. 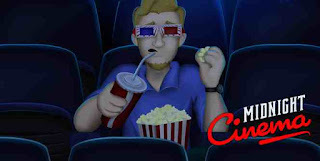 Midnight Cinema is the first of this developers games that I had the pleasure of playing, and whilst it is far from the most challenging of games within this genre, it was none the less enjoyable. So much so, that I have subsequently found myself playing through a handful of their adventures every week. Midnight Cinema is still however in my opinion, one of the best games that they have released to date. Pleasingly illustrated and presented in the style of an episode of Tales From the Crypt, Midnight Cinema follows the exploits of Vova as he tries to gather the items required to bribe his neighbor into handing over their ticket for the late night screening of a new horror sensation. Not that games like this are ever that straight forward. With gameplay that will be familiar to anyone whose played a point and click adventure game before, you'll be traveling from location to location, interacting with NPC's and, overcoming obstacles through the creative and intuitive use of the items in your inventory. This is probably the only area that this game falls down in. It isn't too hard to fathom out how and when some of the items should be used (like the crowbar and the screwdriver), and part of the fun of some of the more offbeat classics was the weird and wonderful way in which stuff in your inventory interacted with the world. That is such a minor criticism though, of an otherwise nicely executed game; that I'd highly recommend to anyone whose a fan of the genre.